I found this book to be great and would recommend it to anyone looking for some tidbits on how to improve all aspects of their personal life. Maxwell has developed 12 core principles to live by when making decisions and managing their lives. While reading the book I guarantee you’ll find yourself reflecting back on certain decisions and how they shaped your life. 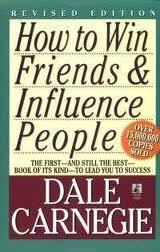 A must read for someone looking for some insight on how to improve every aspect of their personal lives. If you’re someone like me who loves inspirational quotes then the book is a must read for that reason alone – it is chalked full of outstanding inspirational quotes. This book was highly recommended by numerous people so I grabbed it and gave it a read. At first I was a little skeptical because of the title. My first thought was this book was for people that were losers, people that don’t have any friends or for people that are looking to become a con artist, but this couldn’t have been any further from the truth. The book focuses on teaching you how to interact with people, little things like making sure to always ‘thank’ people and how far simply smiling can go. FYI, the book was written in the 1930’s leading to some terminology that can be a little outdated. However, the overall content in the book is far from outdated. Anyone in the sales profession in particular could really see a nice spike in their sales numbers with the subtle ways Carnegie suggests interacting with other people. I read and try to get my hands on as much as I can that Mike Boyle puts his name on because of the success he has had as a strength coach with both his college and professional athletes at Mike Boyle Strength & Conditioning as well as at Boston University with the men’s hockey team and with what the future holds for him as the new strength coach for the Boston Red Sox…Mike’s track record of success speaks for itself and his knowledge in human performance is virtually unmatched. I read Mike’s first book years ago but hadn’t got around to reading his follow up book until now. A lot of the information/exercises/philosophies in the book aren’t exactly new to me as the programming at UNH is very comparable to the recommendations in the book. What the book did do was hammer home the reasons as to why we do what we do. I also found out that after spending more and more time in the strength & conditioning field some of the information in the book really started to “click” the second time around. For anyone trying to get into the strength and conditioning field or enhance their overall knowledge in the field, Advances in Functional Training is a must read – probably more than once.